If you can’t stand the heat, stay out of the AT&T Center. You’d expect a team called the Heat to prosper in warm conditions but a broken air conditioning system handed Spurs a big advantage and it was one the team from San Antonio took full advantage of. The final score of San Antonio Spurs 110 and Miami Heat 95 sees the Spurs take a 1-0 lead in the 2014 NBA Finals. James may have notched up the most points on the court, with a total of 25 points, but he never saw the game out. The heat in the building was a negative point for the Heat and James went down with muscle cramp late on in the game. It looked as though he was tiring and wilting as the game wore on. This alone probably spurred on the Spurs to a greater level of performance while some Heat players may have found their effort and enthusiasm wilting as one of their key players struggled to stay in touch with the rhythm and heat of the game. While Spurs clocked up a convincing win in the end, it wasn’t always looking as though that was the case. With less than 10 minutes to go, Miami were leading by 7 points at 86-79 but this was when the Spurs went into over-drive. In the final 9 and a half minutes of the game, the Spurs pulled in 31 points to just 9 from Miami, turning the game on its head. Danny Green delivered three 3 pointers alone in this period, equalling the total of points that the Heat notched in the run-in. Given the strong performance from the Spurs in the final stages, you get the feeling this game will be remembered in the future by referencing to the broken down air conditioning and the stifling heat in the arena. Tim Duncan was the top scoring player for the Spurs, grabbing 21 points and 10 rebounds. Duncan delivered all this in just 33 minutes and this included 9 for 10 from the court’s floor. Game 2 in the 2014 NBA Finals is coming up on Sunday June 8th, once again being played in San Antonio. You will have to hope that there are no electrical failings that impact on this game and while NBA officials never had an issue to make with regards the first game (as no one was slipping on court they felt there was no call to make), they have announced they strongly expect the AC issues to be resolved by Game 2. The bookies strongly expect San Antonio Spurs to make it 2-0 in the series. If you bet with Bwin, you’ll find odds of 1.45 for the Spurs while the Heat can be found at 2.80. Bet365 have not yet made their lines for Game 2 public yet but if you are looking to place a bet on the series, you’ll find odds of 1.41 for the Spurs while the Heat is listed at 3.00 to repeat last year’s success over San Antonio. Want to know how to bet on the NBA Finals? 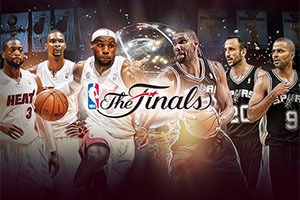 Make sure to have a look at our recently added NBA Finals Betting Guide following the link. As always, a lot of talking points for fans to mull over in the next few games and there will be big questions asked of the players once again on Sunday in San Antonio.